I received Jesus Calling for my birthday last year. I usually start a new devotional book at the beginning of the new year. So, when January rolled around I picked it up not knowing that this book would be a game changer. And when I say it’s a game changer I don’t say that flippantly at all. There’s no doubt that Sarah Young has listened to our Savior’s voice. Each day’s devotion is short but yet so powerful. I can feel the Lord speaking deep into my heart in a way that I’ve never experienced before with any other devotional. Sarah writes as if Jesus Himself was speaking to us; she shares words of reassurance, comfort hope and so much more. Each morning I look forward to diving into the book to see what the Lord has for me that day! There have been days when I’ll read the devotion over and over again because it’s so good; I’m like a sponge soaking it all in! 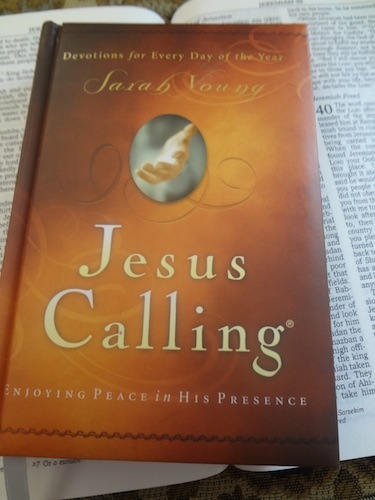 Whether you’re looking for a devotional for yourself, or need a gift for a friend, Jesus Calling (that’s my affiliate link) will not disappoint. There’s no doubt that your life will be changed within the first week of reading these awesome devotions. This is not a sponsored post. As always, all opinions are my own. i would be so grateful and blessed if I could get daily devotionals from you. I’m at a place in my life where I need them, where I need him most..
Deborah, you can sign up to get free daily devotionals by email from Our Daily Bread (http://odb.org/subscriptions/)!